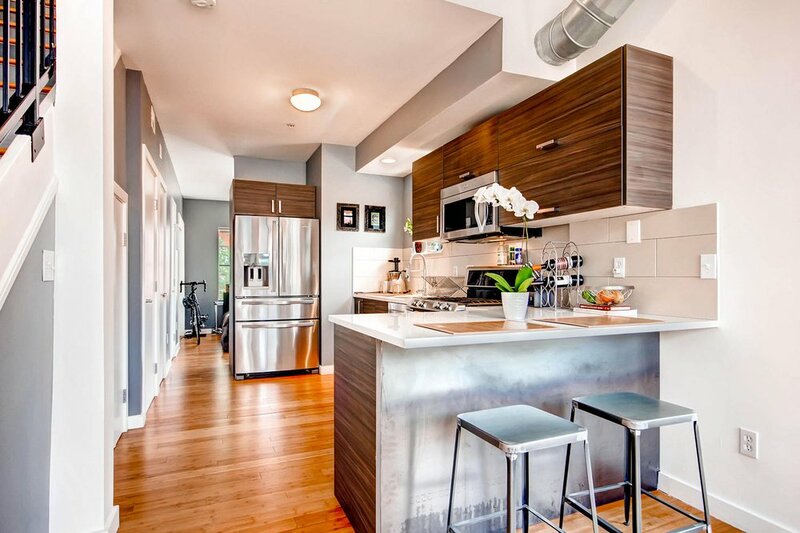 A Denver loft David Schlichter sold in 2015 for a record-breaking price. 2015 was a banner year for residential real estate in Denver, and it appears that the trend of low inventory, high demand, and rising prices will continue in 2016. Here is what you need to know if you are thinking about selling or buying Denver residential real estate in 2016! On average, all residential real estate prices in Denver County ended the year up 10.9% from the end of 2014. Detached single family home prices were up 9.1% year over year, while attached single family home prices were up a whopping 16.2%. In December 2015, the average detached single family home in Denver sold for $434,577, and the average attached single family home sold for $364,860. Colorado’s population grew by 101,000 last year, and it is expected to grow by another 100,000 in 2016. Residential rents in metro Denver rose nearly 10% in 2015 to a median of $1,952. If cyclical trends continue, in 2016 (for the first time in recent history) the number of closed sales in a given month may exceed the number of active listings that month (this is possible because closed transactions generally result from prior months’ active listings). In December 2015, Denver had only one month of inventory available for sale (months of inventory means how long it would take for all of the active homes to sell at the current rate if no new homes hit the market). A seller’s market is defined as a market in which there are less than six months of inventory available, so Denver is an extreme seller’s market. The number of active listings in Denver in December 2015 was at the lowest level ever in recent history for the end of year. If cyclical trends continue, it is likely that this February and/or March there will be less homes on the market than ever in recent history. In December 2015, the median Days On Market was 14, the lowest level at year end in recent history. The DOM figure has dropped, on average, every year over the last five years, and if trends continue, we will see even shorter DOM in 2016. 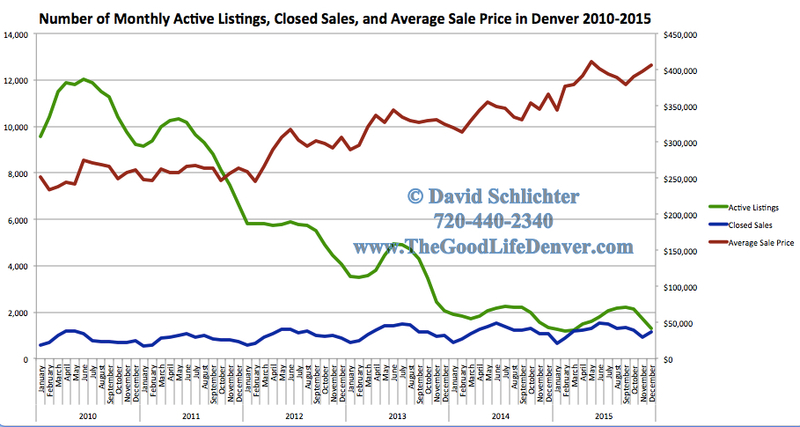 There is no dispute that it is a phenomenal time to be a seller in Denver. Given the market appreciation in recent years, the average seller who has owned their property for a year or more will likely walk away with (potentially significant) proceeds when selling their property in 2016. Average sale prices are up, days on market are down, inventory is exceptionally low, and buyer demand is high. The Denver market needs more inventory (desperately), and the odds are your home is perfect for someone out there looking for it today–literally right now. Keep in mind if you are selling a house in Denver in 2016 that you’ll need a place to move to–just as your sale price will likely be higher than your original purchase price, your new purchase price will also likely be higher if you plan to stay in Denver. Given that it’s a great time to be a seller, does that mean that it is a horrible time to be a buyer? I believe that it is a great time to be both a buyer and a seller, but below are the glass half-full or half-empty arguments. Inventory levels are at record lows (supply). The number of closed transactions are averaging record highs and the population is continuing to increase at the second fastest pace in the country (demand). Exceptionally low supply and exceptionally high demand is resulting in prices rising to record highs and Days On Market dropping to record lows. It is a very strong seller’s market–this year it was more common for a property to get multiple offers than not, and signs are pointing toward another summer of intense bidding wars. And to top it all off, interest rates are finally going to rise this year. Interest rates are still near historic lows, though they are expected to rise in small increments this year. Even with slowly rising rates, loans are still incredibly cheap at around 4-4.5% for a 30-year fixed rate loan–just ask someone who bought a house in the early 1980’s, when interest rates neared an average of 18%! Yes, prices are rising, but they’ve been rising for years, and they are expected to continue to do so. If homes appreciate at the same rate this year as they did last year and you put 20% down, the return on your investment (since your investment would be levered) would be approximately 54.5%. What other market or product is offering that type of return in today’s world? And, what is the next best alternative for your living situation? With median rents at $1,952, renting is more expensive than ever. In a city experiencing double-digit percent appreciation on average, Denver is booming, and I don’t foresee people stopping moving here any time soon–so get in while you can, odds are prices (and interest rates) will continue to rise! All signs suggest that 2016 is going to be another banner year for Denver residential real estate. Sellers will likely enjoy favorable price appreciation, low days on market, and multiple offers–particularly when working with a highly competent and strategic agent. Buyers will still benefit from historically low interest rates and likely above-average appreciation for when their purchase is complete, though the purchase process itself may be stressful and could involve multiple offer situations. While I do believe Denver home prices will continue to rise at a rapid rate in 2016, I believe the rate of appreciation will be somewhat slower than it was last year. And, of course, even though it is unlikely, something calamitous could happen to Denver or to the economy that could cause prices to stagnate or even drop. If you are considering selling or buying Denver real estate in 2016, it is important to work with someone who is intimately familiar with the market, highly intelligent and strategic, an exceptional negotiator, and communicates proactively and effectively. Contact me today to discuss how I can help you achieve your Denver real estate goals.